In downtown Kolkata, a man covers his face from the intense air pollution which plagues the city. It is believed that upwards of 70% of people in the city suffer from some form of respiratory problem, as a result of the city's air. In downtown Kolkata, a man covers his face from the intense air pollution which plagues the city. It is believed that upwards of 70% of people in the city suffer from some form of respiratory problem, as a result of the city's air. On the outskirts of Kolkata, men carry baskets of leather trimmings to a large cauldron for burning. The small pieces are burnt, dried and then sold for use as food for farm animals, such as chickens, or for use as fertiliser. Burning of the leather produces harmful gases that are released openly into the surrounding air. Workers often have little to no protection against the harmful smoke that is released. 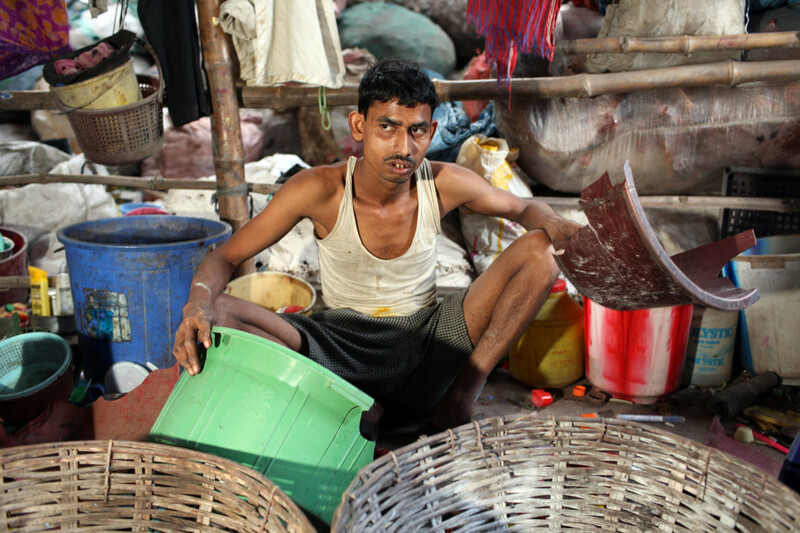 On the outskirts of Kolkata, men carry baskets of leather trimmings to a large cauldron for burning. The small pieces are burnt, dried and then sold for use as food for farm animals, such as chickens, or for use as fertiliser. 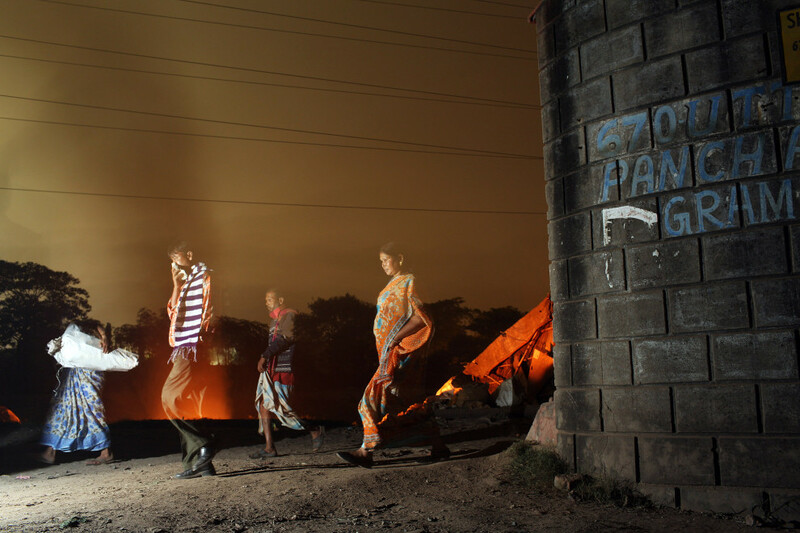 Burning of the leather produces harmful gases that are released openly into the surrounding air. Workers often have little to no protection against the harmful smoke that is released. A man looks up from a sewer drain in central Kolkata. The city's sewerage infrastructure is struggling to cope with an increasing population and subsequent usage demand. 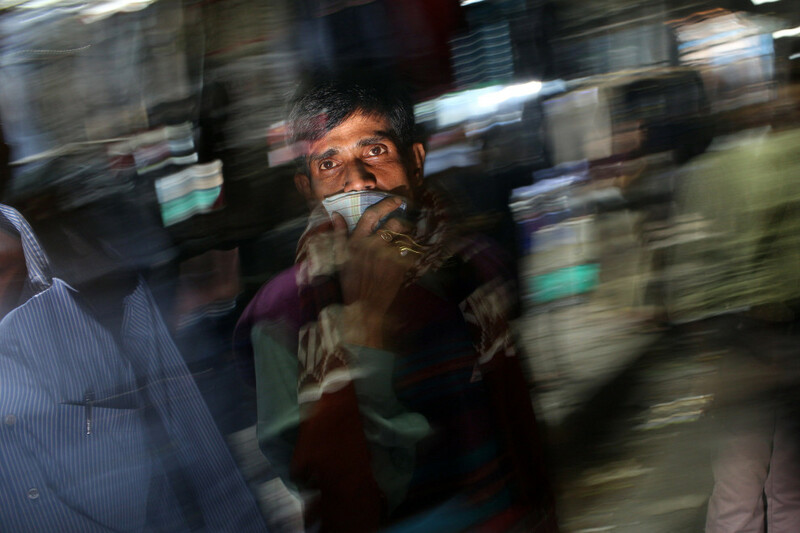 A man looks up from a sewer drain in central Kolkata. The city's sewerage infrastructure is struggling to cope with an increasing population and subsequent usage demand. Woman stand on top of the Dhapa landfill, the destination for much of Kolkata's solid waste over the past 30 years. It is estimated that only 10% of Kolkata's waste is recycled, contributing to the growing problem of the municipality's disposal of waste that is sitting just a couple of kilometres from the city's downtown area. Woman stand on top of the Dhapa landfill, the destination for much of Kolkata's solid waste over the past 30 years. It is estimated that only 10% of Kolkata's waste is recycled, contributing to the growing problem of the municipality's disposal of waste that is sitting just a couple of kilometres from the city's downtown area. 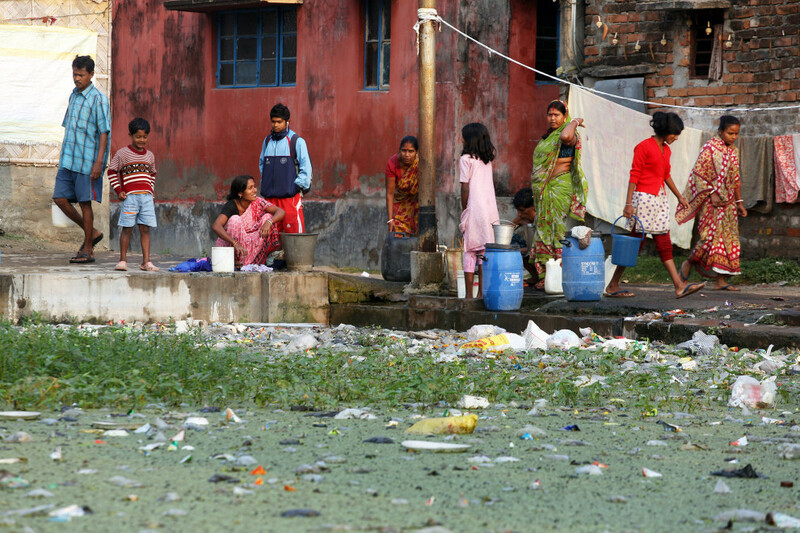 Residents of the Captain Bherry community in Kolkata gather around a water pump in the early morning. In the foreground a small pond is suffering from sever eutrophication, a phenomenon caused by excessive nutrients being released into the water, resulting in the proliferation of algae on the surface and subsequent death of aquatic life below. Residents of the Captain Bherry community in Kolkata gather around a water pump in the early morning. In the foreground a small pond is suffering from sever eutrophication, a phenomenon caused by excessive nutrients being released into the water, resulting in the proliferation of algae on the surface and subsequent death of aquatic life below. A man washes himself at sunset on the banks of the Ganges River, in central Kolkata. A man washes himself at sunset on the banks of the Ganges River, in central Kolkata. Foam floats not the surface of the Bhangar Canal, on the eastern outskirts of Kolkata. Flowing off of the nearby Vidyadhari River, the canal receives water mostly from nearby tanneries which process leather. At various points along the canal, toxic wastewater from the tanneries is released into the nearby waterway. At sluice gates nearby, the water has turned to foam as the chemical-laced water is churned up. Foam floats not the surface of the Bhangar Canal, on the eastern outskirts of Kolkata. Flowing off of the nearby Vidyadhari River, the canal receives water mostly from nearby tanneries which process leather. At various points along the canal, toxic wastewater from the tanneries is released into the nearby waterway. At sluice gates nearby, the water has turned to foam as the chemical-laced water is churned up. 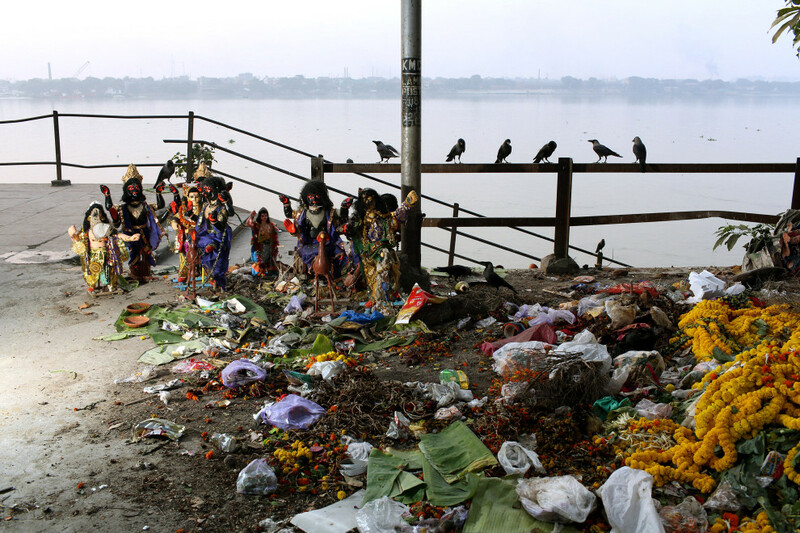 Crows watch over Hindu idols and piles of garbage discarded near the banks of the Ganges River. Crows watch over Hindu idols and piles of garbage discarded near the banks of the Ganges River. In the A.K. Steel Market in central Kolkata, workers carry baskets full of discarded metal after they have been used for making bottle tops. In the A.K. 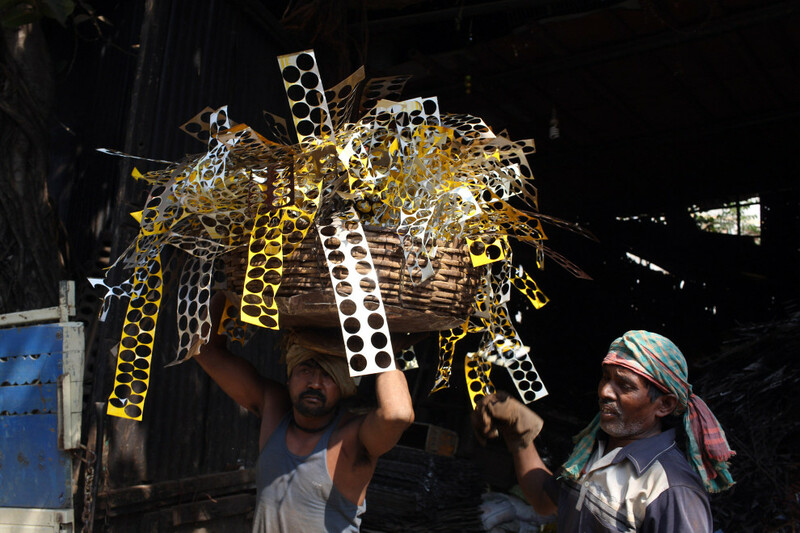 Steel Market in central Kolkata, workers carry baskets full of discarded metal after they have been used for making bottle tops. 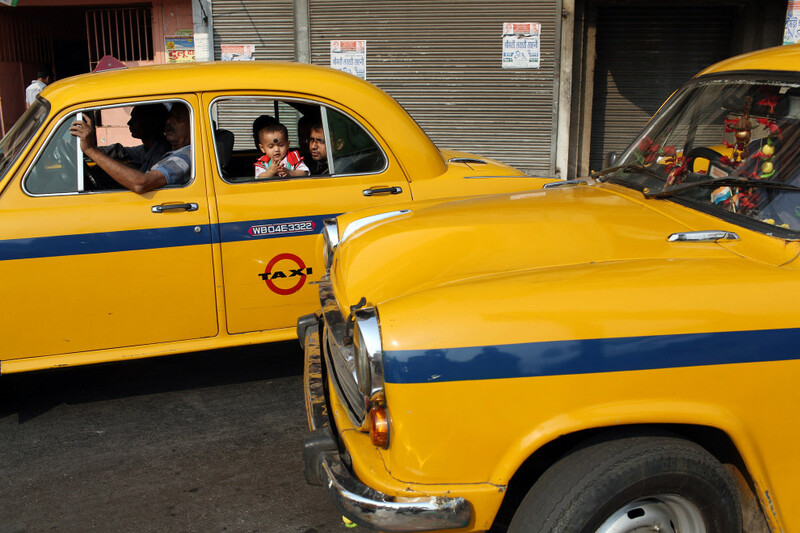 A young child looks out from one of Kolkata's iconic 'ambassador' taxis. Traffic is an increasing problem which is choking the city. A young child looks out from one of Kolkata's iconic 'ambassador' taxis. Traffic is an increasing problem which is choking the city. Residents of the Captain Bherry community in Kolkata gather around a water pipe in the early morning. Poverty is still rife in the city and access to plumbing remains a privilege for many. Residents of the Captain Bherry community in Kolkata gather around a water pipe in the early morning. Poverty is still rife in the city and access to plumbing remains a privilege for many. Kolkatans walk past a fire burning plastics in the Topsia Street district, in the east of the city. The area is notable for its informal plastic recycling industry. Waste is often discarded and burnt in the evenings. Kolkatans walk past a fire burning plastics in the Topsia Street district, in the east of the city. The area is notable for its informal plastic recycling industry. Waste is often discarded and burnt in the evenings. 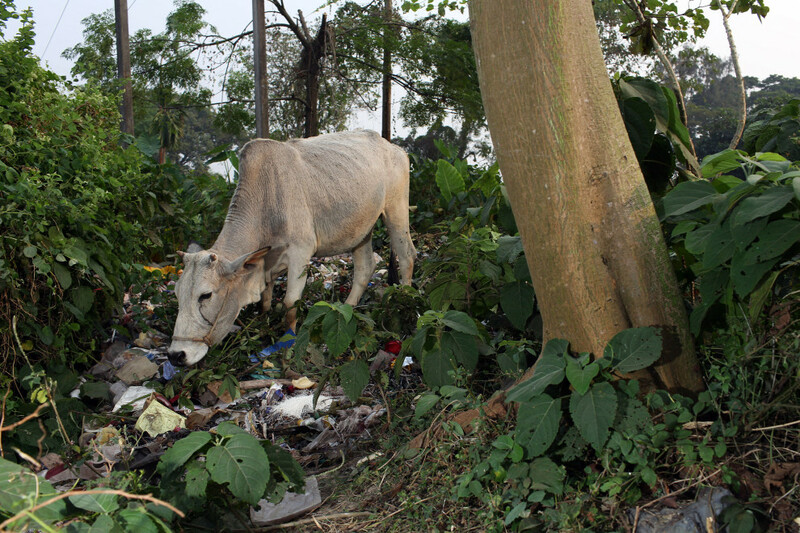 A cow grazes in littered field on the side of a highway in east Kolkata. The cow is seen as a holy and revered animal in Indian culture, however even it is not safe from increasing pollution, especially in urban areas. A cow grazes in littered field on the side of a highway in east Kolkata. The cow is seen as a holy and revered animal in Indian culture, however even it is not safe from increasing pollution, especially in urban areas. 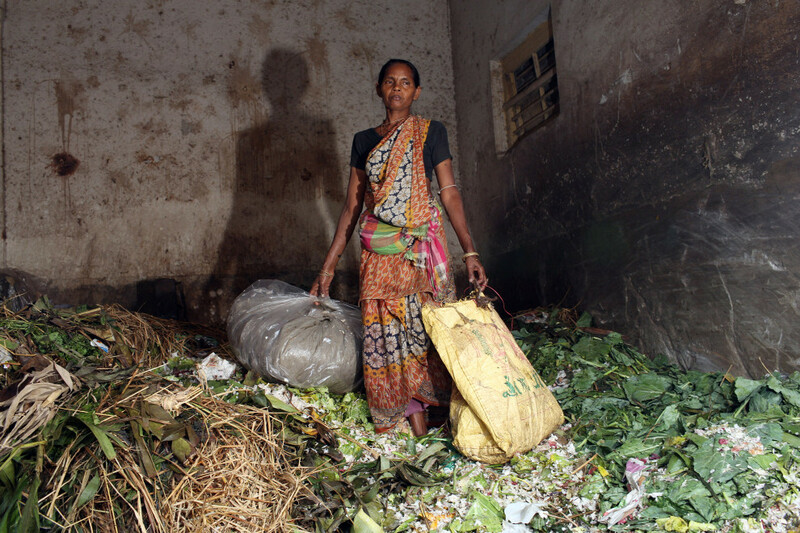 Sara Swati Mondol, 45, stands in a refuse collection point in the Kolay Market in Kolkata. She collects discarded plastic which she later resells in her village. She has been doing this job since childhood earns around US$1 per day. 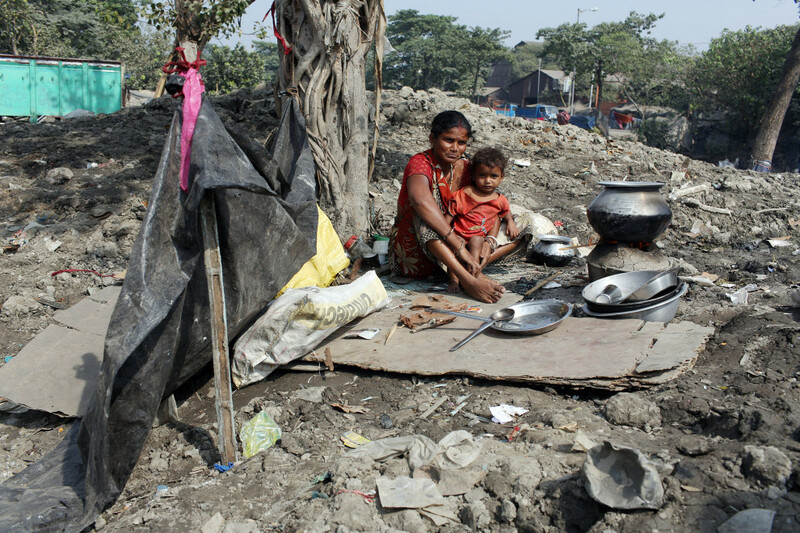 Many millions of Indian people still live below the poverty line and are the set or of society often most vulnerable to pollution. Sara Swati Mondol, 45, stands in a refuse collection point in the Kolay Market in Kolkata. She collects discarded plastic which she later resells in her village. She has been doing this job since childhood earns around US$1 per day. Many millions of Indian people still live below the poverty line and are the set or of society often most vulnerable to pollution. A woman and child, who are refugees from Bangladesh, sit on the banks of a canal in the Rajabazar district of central Kolkata. The government has recently cleared the banks of the nearby canal in attempt to clean up the waterway. A woman and child, who are refugees from Bangladesh, sit on the banks of a canal in the Rajabazar district of central Kolkata. The government has recently cleared the banks of the nearby canal in attempt to clean up the waterway. A man sorting through different types of plastic goods in an informal recycling centre in the Topsia Road district of eastern Kolkata. A man sorting through different types of plastic goods in an informal recycling centre in the Topsia Road district of eastern Kolkata. Two children in the grounds of a brick factory, in the Malancha district of eastern Kolkata. As their parents work nearby, children often play in the area, exposing them to harmful materials and waste produced in the industrial process. Two children in the grounds of a brick factory, in the Malancha district of eastern Kolkata. As their parents work nearby, children often play in the area, exposing them to harmful materials and waste produced in the industrial process. Against smoggy skies, a man walks his daughter across a busy street in central Kolkata. According to the Delhi-based Center for Science and Environment, in their report 'Air Quality and Mobility in Kolkata', "18 out of every 100,000 persons in Kolkata fall victim to lung cancer annually. 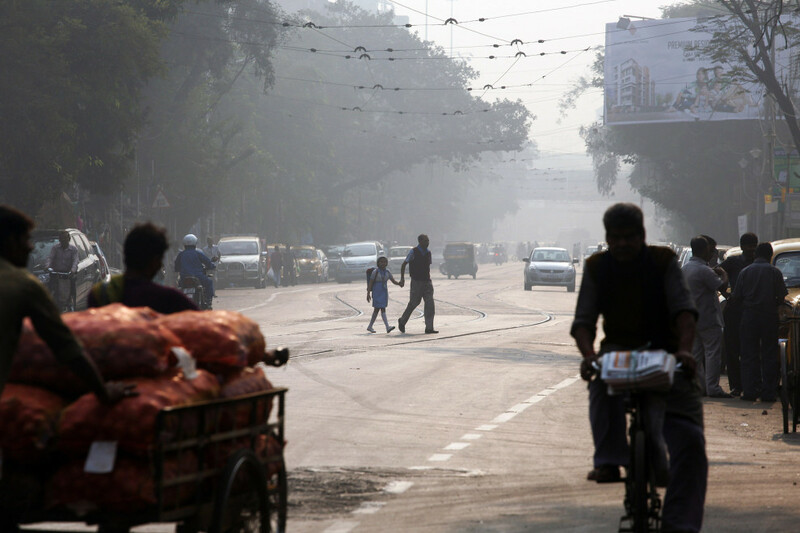 Seven out of 10 people in Kolkata are afflicted with some form of respiratory ailment. Also the percentage of children suffering from upper respiratory infections, cough, wheezing and eye irritation is increasing in direct proportion to the increasing concentration of PM10." Against smoggy skies, a man walks his daughter across a busy street in central Kolkata. According to the Delhi-based Center for Science and Environment, in their report 'Air Quality and Mobility in Kolkata', "18 out of every 100,000 persons in Kolkata fall victim to lung cancer annually. Seven out of 10 people in Kolkata are afflicted with some form of respiratory ailment. Also the percentage of children suffering from upper respiratory infections, cough, wheezing and eye irritation is increasing in direct proportion to the increasing concentration of PM10." 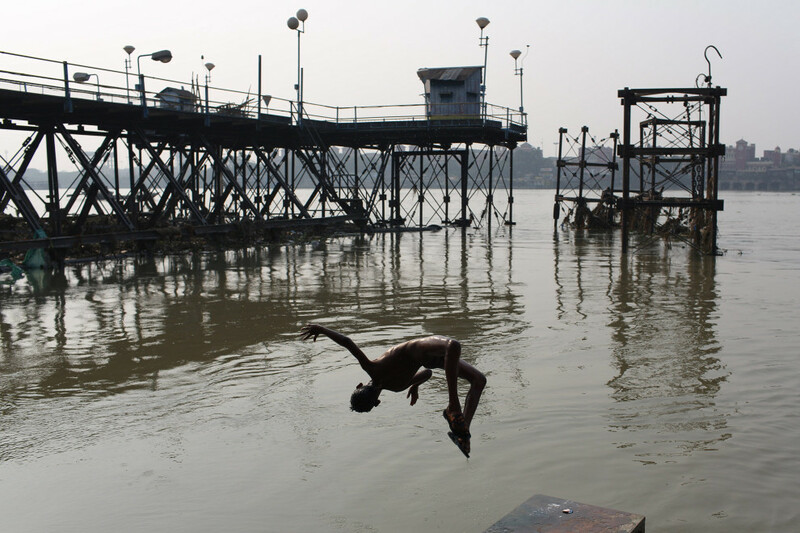 A child jumps in the Ganges River near a jetty in Kolkata. 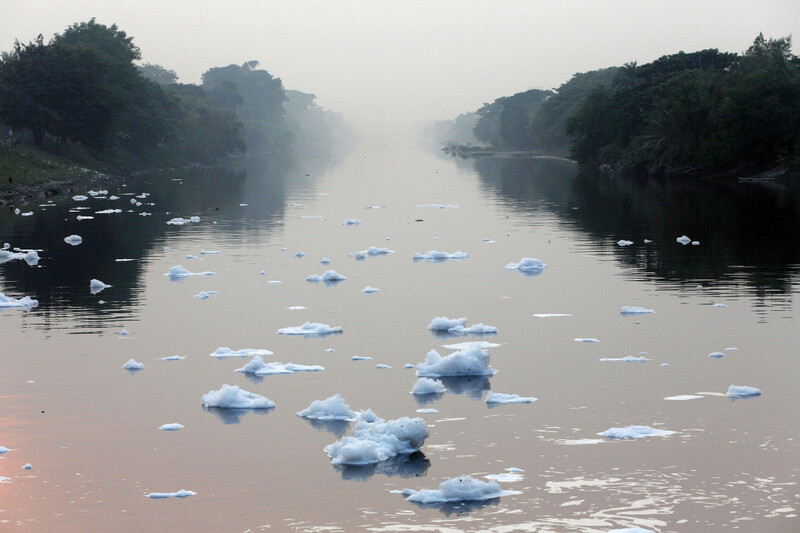 Upon entering the city, the river is saturated with a mix of domestic and industrial waste that has accumulated as it has passed through numerous states in northern India, making it one of the most polluted rivers in the world. A child jumps in the Ganges River near a jetty in Kolkata. Upon entering the city, the river is saturated with a mix of domestic and industrial waste that has accumulated as it has passed through numerous states in northern India, making it one of the most polluted rivers in the world. “I am concerned about pollution. Lots of people are getting cancer and diseases,” says Dulal Chandigiri, as he scrubs a bicycle tire outside his small workshop in the Tiljala area of central Kolkata. He is squatting down next to the small lake which sits just a meter or two from the front door of a small shack made of corrugated iron that has been his home for the past 42 years. Kolkata is home to Dulal and some 14 million other people who reside in a sprawling metropolitan zone which spreads out from the banks of the Hooghly River, the last arm of the Ganges. One of India’s major urban hubs, the city sits on the edge of the Bay of Bengal and has attracted millions of migrants since India gained independence from Great Britain in 1947. Today, the city appears to be at bursting point. At every crossing, traffic chokes the streets. People battle for space on the busy sidewalks and barges criss-cross the Ganges, packed with workers commuting across the great waterway. Among the bustle however, environmental threats linger silently in the air, water and soil. “Air quality. That is a problem for us. The suspended particulate matter in particular. So much particulates and dust particles,” says Professor Binay K. Dutta, chairman of the West Bengal Pollution Control Board, as he sits in his cool air-conditioned office in the center of the city. “During the winter months, sometimes it goes above the permissible limits. So that is a problem and much of it comes from motorcycle exhaust. Seventy to eighty percent of particulates come from automobile exhausts,” he explains. Walking the streets of Kolkata on an early morning in late November, the golden sunrise struggles to burn through the layer of smog that sits on top of the city. Cars, motorbikes and tuk-tuks cram the streets. As the city’s rush hour comes into full force, every inch of road is fought over. The scourge of air pollution is a problem facing many developing nations in Asia, especially those seeing a dramatic rise in the use of vehicles on the streets. 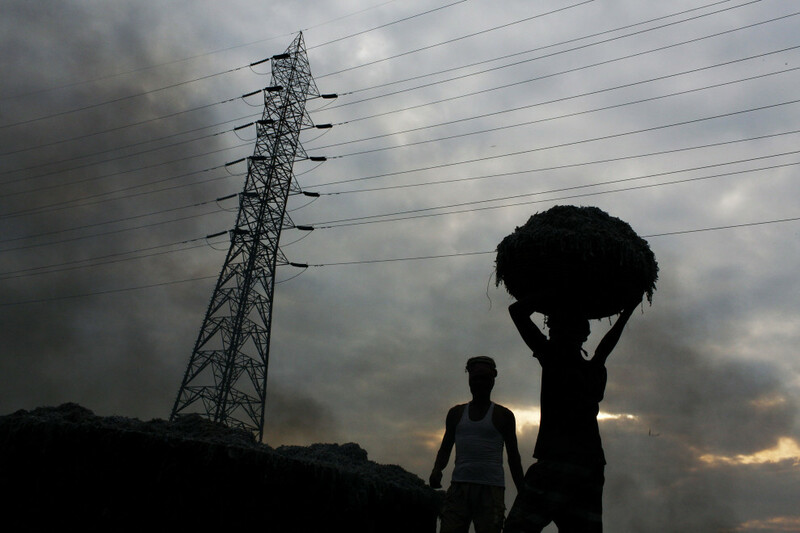 It’s not just the air which threatens the people of Kolkata. The water supply is also coming under increasing pressure as the city struggles to cope with severe pollution that originates both within the city and outside of the state. For many Kolkatans, the problem of water pollution is all too real, particularly so to the east, where the city’s many waterways flow. “In daily life, we don’t use water from the canal,” says Shaiful, a 25-year old fishery owner. He’s standing near a sluice gate on the Bhangar Canal on the eastern outskirts of Kolkata. Flowing off of the nearby Vidyadhari River, the canal receives water mostly from nearby tanneries which process leather. At various points along the canal, toxic wastewater from the tanneries is released into the nearby waterway. Close by, in the rural district of Dhapa on the edge of the city, lies a small hill. At least at first glance, it appears to be a hill. As one approaches, flocks of crows can be seen circling and thick dense smoke rises from fires dotted across its summit. Small figures can also be seen, scurrying across a haphazard surface. This is the Dhapa landfill, the destination for much of the city’s solid waste over the past 30 years. It now stands at around 10 stories in height and covers and area of approximately 10 hectares. Like many cities across India, a growing population is bringing with it a growing problem of domestic waste. “The disposal site has served the City of Kolkata as an uncontrolled dumping ground since 1981,” states SCS Engineers, specialists in environmental engineering contracts and consulting, in their report for the Kolkata Municipal Corporation. In November 2013, the site is still clearly in use. Trucks stream through the entrance gate, piled high with domestic waste from around the city. 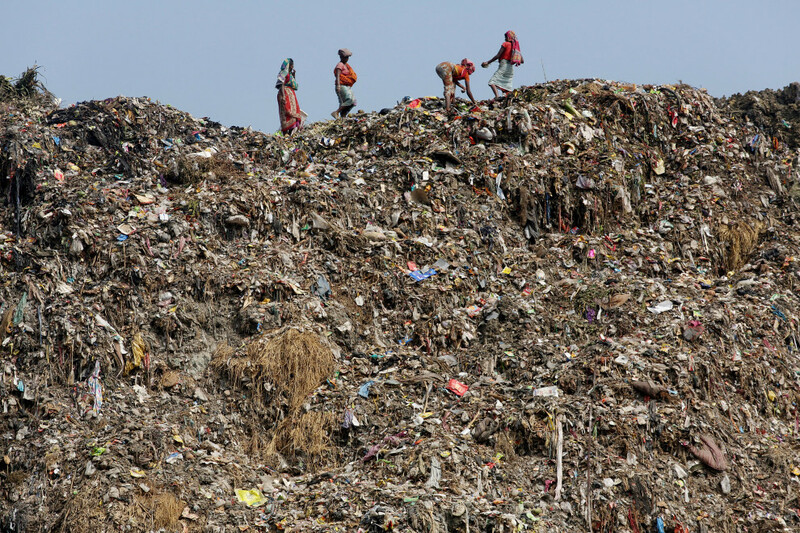 Workers stand on the precipitous edge of the mountain of garbage, throwing various items off to their fellow workers below who sift through and segregate various items that can be recycled and sold. It is estimated that only 10 percent of Kolkata’s waste is recycled, contributing to the growing problem of the municipality’s waste disposal, just a few miles from the city’s downtown area. Greater still are the implications for the Kolkata wetlands, a site meters away identified by the Ramsar Convention on Wetlands for its importance and significance. 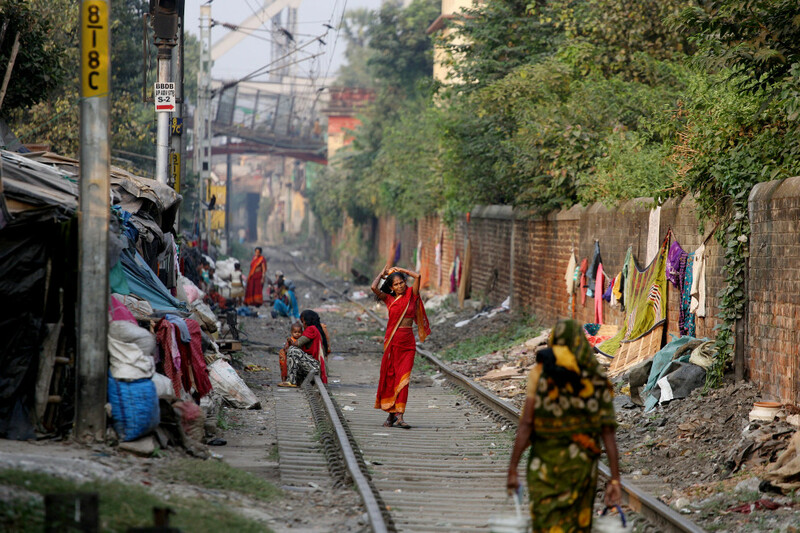 Walking along the edges of Kolkata’s garbage mountain gives the impression of a city slowly being choked. Air, water and soil come under fire of Kolkata’s rapid growth.